Standing with mayors from across the country in Texas Thursday, Mayor Bill de Blasio decried the “inhumane” policy that led to the separation of thousands of immigrant children from their parents and said President Donald Trump’s Wednesday executive order “has not solved the problem. Later Thursday, Trump said he was directing federal agencies to begin reuniting children and parents who had been separated, but no specific timeline was announced. Facing outcry, Trump had signed an executive order on Wednesday to stop the separations and detain families together. The order moves parents with children to the front of the line for immigration proceedings, but it does not end a 10-week-old “zero tolerance” policy that calls for prosecution of immigrants crossing the border without legal permission. De Blasio visited an East Harlem shelter Wednesday where hundreds of children had been brought after they crossed the U.S.-Mexico border. He said he had only learned about their arrivals that day, despite them first coming months before. In Texas, he repeated the story of 9-year-old Eddie, who was taken from his mom and put on a bus from Texas to New York City. “Think of how broken that is, and our government didn’t even tell us it was happening,” he said. The mayor said later Thursday that he would make sure the children housed in the city have “legal support” and that “mental health services and the physical health services are there for them. De Blasio said the gathering in Texas, organized by the United States Conference of Mayors, was a symbol of hope. 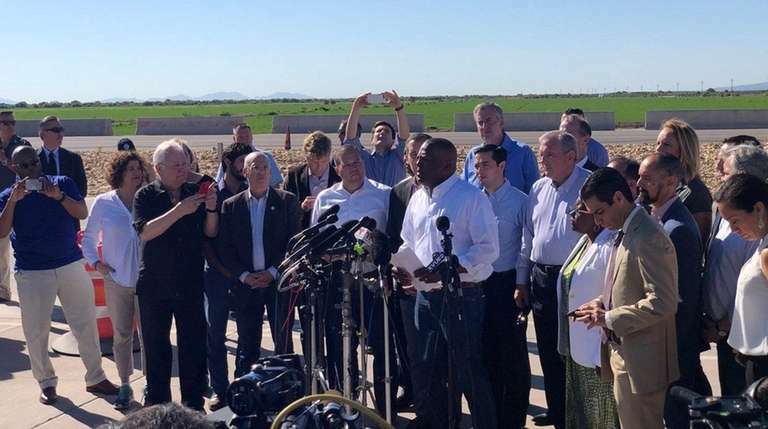 The mayors planned to tour the Tornillo Migrant Children’s Facility, but they were denied entry. “The fact is this is our federal government denying access, not allowing information — and it’s not American, it’s crazy. They’ve turned away senators, they’ve turned away members of Congress, I’ve never seen anything like this. These are public facilities payed for with taxpayer dollars. How on Earth are we not allowed to see what is happening to these children?” de Blasio said. 'Traumatic process' for immigrant kids taken from parents: MayorAn East Harlem shelter has processed over 350 kids affected by the family separation policy. Trump reverses course on separating kids detained at borderTrump signed an executive order on his family separation policy on Wednesday.